Store and carry your art supplies in style with the Utrecht Wooden Acrylic Paint Box. This handsome paint box is made of solid beechwood that's been hand-rubbed with special oils to preserve the rich luster of the natural wood. Its genuine leather handle and brass hardware will last for years. 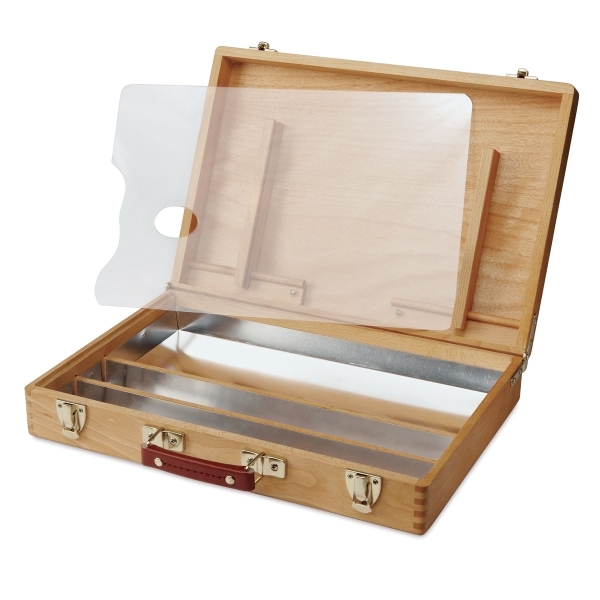 The interior features a hard plastic palette, aluminum-lined compartments, and a wet-canvas panel holder in the lid so you can easily carry your finished painting back to the studio. The box holds at least a dozen 5 oz (148 ml) tubes of paint (not included). The Utrecht Wooden Acrylic Paint Box measures 15" × 10½" × 3¼" when closed. 15"L × 10½H" × 3¼D"